TURBO POWER: Hunting for that perfect pair of Wireless Earbuds? You just found it! You won't want anything else after you've tried these robust noise cancelling Wireless headphones. COMFORT TO CRUISE its ergonomic design rests securely in your ear canal. IPX7 WATERPROOF - SWEAT PROOF. IPX7, nano technology protects the headphone from a lifetime of rain and sweat. Have peace of mind safe from accidental immersion. IF YOU KNOW SOUNDWHIZ, YOU'LL KNOW WE CARE ABOUT ACOUSTICS. Latest APT-X and CVC 6.0 noise reduction technology gives jaw-dropping sound quality, eliminating unwanted noises and delivering a crisp clear sound experience. MULTI-POINT FUNCTIONALITY. Pair with two different devices. iOS BATTERY CAPACITY See when it's time to recharge so you're never caught short. SoundWhiz provides a person to talk to with second to none after-sales service that you can rely on. With a lifetime guarantee against sweat we work hard to deliver the best wireless audio products for our raving fans. INCREDIBLE HD SOUND Running headphones. Take your fitness to the next level. Feel the beats with massive 10mm Dynamic Drivers delivering CRYSTAL CLEAR HD SOUND, POWERFUL BASS with well balanced mids and trebles and outstanding volume. 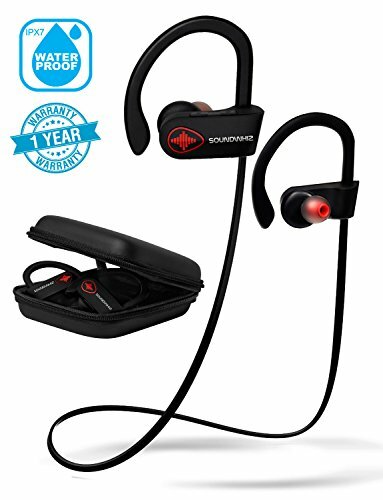 Soundwhiz Turbo Bluetooth Running Earbuds are DESIGNED FOR SUPERIOR COMFORT and in-ear stability, perfect for extended wear. Where other headphones feel awkward with sunnies, headbands or eye glasses these sport headphones have hooks that fit neartly underneath the arms of your glasses for superior comfort. Totally SWEAT PROOF - Lifetime protection against water and sweat with IPX7 water resistance. POWERFUL & ROBUST! Massive 100mah battery delivers up to 8 HOURS OF PLAY TIME - enjoy a whole week of workouts on a single charge (charges in just 2 hours). The built-in noise cancelling microphone and dual pairing gives the Turbo the versatility to run a full day's music at the office too. Comes with a part charge to get you going right out of the box! EASY TO USE - Pairs in seconds to all Bluetooth enabled devices (iPhone, ipod, iPad, android cell phones, Windows & Mac computers, Bluetooth TVs etc). All controls are on the headphone body enabling you to be completely hands-free from your phone - and tangle-free during your workouts. BUY RISK FREE WITH PEACE OF MIND THANKS TO OUR 30 DAY REFUND POLICY & 12 MONTH EXPRESS REPLACEMENT WARRANTY. Our Customer Service Beats Everyone - Just Try Us! IF BUYING AS A GIFT - we commit to looking after the recipient just the same as we would look after you! PLUS, FREE access to professional coach-written running series for every buyer!. Fast delivery - ships from Amazon US. If you have any questions about this product by SoundWhiz, contact us by completing and submitting the form below. If you are looking for a specif part number, please include it with your message.